ELISA standard curve showing measurement of recombinant porcine IL-18 in an assay using clone 7-G-8 (MCA2093) as capture antibody and biotinylated clone 5-C-5 (MCA2094B) as detection antibody. 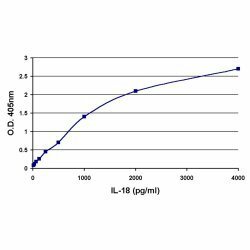 Mouse anti Porcine interleukin-18 antibody, clone 7-G-8 recognizes natural and recombinant porcine IL-18. The antibody does not recognize porcine IL-1beta, IL-8, IL-12 or IFNγ, nor does it cross react with human or murine IL-18. This antibody may be used as a capture reagent in an sandwich ELISA pair with MCA2094B as detection antibody. Muneta, Y. et al. (2000) Detection of porcine interleukin-18 by sandwich ELISA and immunohistochemical staining using its monoclonal antibodies. J Interferon Cytokine Res. 20 (3): 331-6. Lee, B.M. et al. (2011) Enhanced protection against infection with transmissible gastroenteritis virus in piglets by oral co-administration of live attenuated Salmonella enterica serovar Typhimurium expressing swine interferon-α and interleukin-18. Comp Immunol Microbiol Infect Dis. 34 (4): 369-80.